few will be aware of its ancient Celtic roots in the Samhain (Samain) festival. between the lighter half (summer) and the darker half (winter). allowing spirits to pass through. whilst harmful spirits were warded off. Bonfires and food played a large part in the festivities. household fires were extinguished and started again from the bonfire. was ritually shared with the less well off. in 2013 this occurs on November 7th, 2013 aka 07 NOV 2013 at 1:03AM Eastern. I would like to start off by saying that Halloween is NOT the "Witches Holiday". and for Adults to decorate their houses with scary witch and ghost figures. The true Witches Holiday is Samhain, pronounced "Sow-en"
by most people of the Craft in modern day. and it marks the end of the harvest. to prepare for the long winter ahead. Samhain is a Celtic holiday. the light half and the dark half. Beltane for its magickal potentials. sometime in the 1st week in November. Samhain also symbolizes the death of the God, the final turn of the wheel. The days become shorter, the nights longer. a time when the "veil between the worlds" becomes very thin. that have passed from this world to the next. and remember those who have passed. and eaten in silence, with an extra place set in remembrance of our ancestors. lighting their way through the darkness of the upcoming months until Yule. in the Samhain (Samain) festival. and the darker half (winter). The family's ancestors were honoured and invited home whilst harmful spirits were warded off. as harmful spirits and thus avoid harm. The bones of slaughtered livestock were cast into a communal fire, household fires were extinguished and started again from the bonfire. followed by All Souls on November 2nd. The wearing of costumes and masks to ward off harmful spirits survived as Halloween customs. where today it is one of the major holidays of the year. for example the American harvest time tradition of carving pumpkins. which begun on the eve of Samhain (Halloween). Tara was also associated with Samhain, however it was secondary to Tlachtga in this respect. is aligned with the rising sun around Samhain. arrived in Ireland about 2,500 years ago. occurs about the same time as Samhain. could it be that Diwali and Samhain have a common root in antiquity? to the equivalent of New Year's Eve. and so the festivities took place on the Eve of Samhain. of the four Celtic Festivals. which crystallised at the great Fire Festival. to assist the sun on its journey across the skies. in the face of the overwhelming sense of the decay of nature as the winter sets in. the forces of the underworld were in the ascendency. from the abode of the dead. Ghosts, fairies and a host of other non-descript creatures went with him. The Lord of the Dead in Celtic mythology can be identified as Donn. 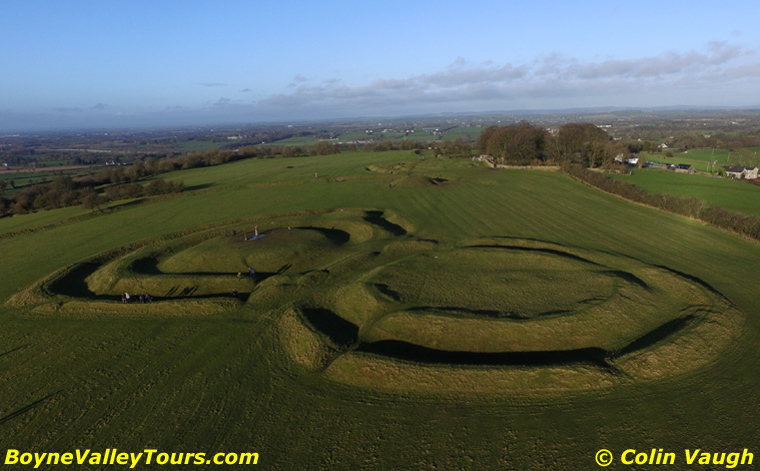 as the Miliseans landed at the Boyne, they made their way to Tara. and sail off the shore to the length of nine waves. When they were on the sea a great storm arose which scattered their fleet. The commander of one of the ships was Donn. along with twenty four of his comrades. He was buried on the Skellig Islands off the coast of Kerry. as such, he became elevated to the status of god of the dead. and soon became identified with with the otherworld. and often they identified their earliest ancestors with the gods of their peoples. the god of the otherworld. is just a few miles from the traditional home of Mog Ruith at Valentia Island. and remains aloof from the other gods. His name means "brown" and he is associated with the shadowy realm of the dead. "To me, to my house, you shall come after your death"
and describe deceased people travelling to and from here. to the island at night and the names of those who disembarked were called out. at his house before departing for hell. Christian writers in their portrayal of the devil. but how they did so remains uncertain. but certain other of the trappings are clearly associated with the Lord of the Dead. - it did not belong to the old year not the new. nd the implications of this were immense. but also with a host of gods, fairies and other creatures of uncertain nature. and it was always advisable to stay indoors. Ghosts were everywhere and may or may not have been harmful to the living. and temporary ascendency of the powers of darkness at this time of year. During this period all the world was in darkness and the dead were abroad. and all other fires could now be relit. while the relighting of the household fire marked the domestic celebration of the feast. with safety and posed no threat to the household. This theme is repeated constantly in Irish literature. MacCollugh tells us that the cult of the dead culminated at the family health. Very often the spirits of ancestors sought warmth around the fireside on this night. Fires were left lighting in the grate to warm the spirits and food was left out for them. it was still a good idea to avoid them by going to bed early. However, the ghosts may not have been entirely benign. They needed some sort of appeasement in the form of ritual offerings on this night. but if the offering was withheld another side of the ghosts features were presented. Bad luck would descend on the household and all would not be well the coming year. invite the household to make a donation or face the consequences. the ancestral ghost on this night. But it was not just time that was dislocated at Samhain. all other boundaries were in danger at this time. to be on this night. between adjacent land was a place of particular dread and best avoided. Bridges and crossroads were also likely places to encounter ghosts. but particularly on this night. Every sort of a ghost was to be seen here and the dead mingled freely with the living. formed a central part of the festivities occurred at Tlachtga at Samhain. and standing in the porch. but runs the risk of meeting himself. will see the image of the man they will marry but also run the risk of seeing the devil. the future but again run the risk of meeting the devil. sunwise turn so important to the Celts in the ritual. attempt to associate the pagan god of the dead with the devil of Christian belief. left his island home on this night and travelled freely throughout the country. Whether he carried off souls is unclear, but it is likely that he did. he was replaced on the arrival of Christianity by the devil. for the warrior troop known as the Fianna. until the return of Summer at Beltainne. made his dramatic entrance to the same court. before setting out on the great Cattle Raid of Cooley. how Samhain is the time chosen by the writers to introduce their arrival on the scene. with the feast of the god of the dead. in our own celebrations of Halloween. the Winter Solstice, the Spring Equinox, the Summer Solstice and the Autumn Equinox. Imbolc, Beltane, Lughnasadh and Samhain. In the United States, the Fourth of July is a day to celebrate liberty and independence. Most other countries have some variation on this theme, a day when we honor the sovereignty of our land and the blessings of nation. Some may honor Lady Liberty or another deity of freedom, or even the deity of the land itself, but for me, it’s a day to honor the ancestors. I am aware, every day, of the liberties I have that my ancestors of a hundred or a thousand years ago would not have had. let alone work or make any of the other hundreds of choices I make every day. (or occasionally very bad) fight to make this life possible for me. Without the ancestors, I would not be, and for their sacrifices, I give thanks. On this day when we celebrate our freedom. And those of you who could not see but still did fight. Ancestors, I pray to you today. I give you thanks for making this life possible. And even if you did not fight, you still did dream. For those less fortunate than I, I pray. To take up the cause of those who have no space for dreams. Give me your courage and your strength. Will give thanks to me for dreaming when they could not. as she discusses how we can contact our ancestors in order to heal ourselves, our loved ones and our spirit relations. ” “Welcoming Spirit Home: Ancient African Teachings to Celebrate Children and Community;” “Falling Out of Grace: Meditations on Loss, Healing and Wisdom, and others. Walking for Water. For more information, please visit www.sobonfu.com or www.walkingforwater.org. Randy Peyser: I understand your name means “Keeper of the Rituals.” Why are rituals important? Sobonfu Somé: What food is to our body, ritual is to our soul. A ritual keeps us connected to our spirit, our soul and our purpose. Rituals are also activities in which we call the spirits of our ancestors to come forward. Our ancestors can see cross-dimensionally, which means they can help us to plot our course. so that we can regain our health or our consciousness. RP: How do you work with the ancestors? Are their prayers that you invoke? SS: In the Dagara tradition, the ancestors are the ones you go to before you go to God. The ancestors know you. “I know there are all these other people screaming at God to help them. RP: It’s that simple? You just ask them to help you? SS: It is important to create a relationship with the ancestors first, but it cannot be a one-way kind of relationship. Anytime the ancestors come through in answering your request, you take a gift to them. or something old or antique. Your gift can either be something they like or something that you like. “Ancestor, I am really grateful for what you have achieved. I’m very happy that you stepped forward, and you really made this happen. RP: How often do you call on your ancestors? SS: As often as needed. We always tell them what we intend to do in that day. We might say something like: “I’m human and I might err here and there. Please show up and help me remember what I said I was going to do today. If there are obstacles, please remove them,” and so forth. At the end of the day, we report back to them about how our day unfolded. didn’t have the best relationship? Is there a way to heal those kinds of relationships once someone has died? SS: In the Dagara tradition, when someone dies they become smarter. You may need to do some healing work with a particular ancestor. So you pray for them and for yourself and talk to them. but that is still driving you crazy today. On the other hand, even if you haven’t called on an ancestor, they might call on you first. You might be the only one in your family who feels like something is not right, or that something within your family is making you crazy. to actually be the bridgemaker between this world and the world of the ancestors. After someone dies, they look around to see who in the family can really help them achieve their goals? or they find someone who is available and wide open, and why not call on that person? They will call on you to help them make right whatever they have done wrong because of the limitations of the body. RP: How does a person receive this message from an ancestor? SS: Through dreams, or through feelings, such as by feeling uncomfortable about things that have happened in the family. or how a person died in a certain way, or why nothing has been done about it by anyone. When you are the one who has been picked by that particular ancestor, you continue to think about the ancestors. RP: When calling on an ancestor, should we only contact those beings who were from our immediate families? The pool of the ancestor has nothing to do with your genealogy; it can be anyone who is an ancestor. and all the brave, “crazy” women who encouraged women to speak up and not let their voices go silent. Trees, animals, rocks, rivers and mountains are also considered to be part of the pool of the ancestors. In the case of someone needing help in creating a bridge to their ancestors, they could call unto the pool of ancestors to come and give them instructions. RP: What about people who were very evil in this lifetime? Would they also be in the pool of ancestors? SS: Yes. As I mentioned, in the Dagara tradition, when someone passes away, they become smarter. To not call on a person would be putting a limitation on him or her as to what he or she could be after death. When you are dead and have become smart, you now owe it to people to make things right. For example, someone like Jeffrey Dahmer could be a great asset. Most people would never think of calling on someone like Jeffrey Dahmer when they are calling on the ancestors. He was a criminal who murdered many people. People would fear that by calling on his name, they would bring in a negative energy. and say: “Look Jeffrey. We know you were very destructive when you were alive. Here is the situation that is about to happen, and you know exactly the kind of mindset that it takes for someone to think of committing this kind of crime. We know that from where you are, you want to change things. He can then come forward and clean up his track record. RP: Can you give me an example of an appeal you made to an ancestor and how you were helped? SS: I am going to answer that question in two ways. It depends on the state I’m in. That’s like telling someone that you want them to come, but if they don’t feel like it, then don’t come. “I really need you to show up right now, because if you don’t, I am going to die, and then guess what? You won’t have someone to be your voice anymore. – and I have always gotten an answer because I have made the issue important. One time I said: “I don’t really know why I’m sick. Every single time I have asked that, I have always gotten better. I have always gotten the message and clear images of what I’ve needed to do. RP: Is there a special place you go to when you speak with your ancestors? SS: There is usually a shrine that you go to and use to invite your ancestors through your prayers in the morning and at night. The shrine is like a gateway, where the ancestors come and you go to in order to interact with one another. RP: When you create a shrine to an ancestor, are their particular objects that you place on that shrine? SS: First of all, each shrine has to have a purpose. What is the purpose of this shrine? What will it help you achieve? or to create a shrine where that ancestor can be put to work in correcting certain things that are happening within the family or within society. You have to understand the purpose for that shrine, and then the purpose will dictate the kind of things you would have on the shrine. A shrine to an ancestor will have anything that reminds you of your ancestors. If it is for a particular ancestor, you can put pictures of that ancestor, or include things that they love. In the Dagara tradition, shrines for the ancestors include the color, red. And they feature things that are old or antique. They also can have masks. The shrine cannot contain a contradiction. For example, you cannot create a shrine for peace and have all kinds of things about war on it. That is a contradiction. Instead, think about all the kinds of things that could bring about peace, and include those kinds of things on your shrine. RP: Calling on our ancestors and working with them is one very powerful way in which we can work with ritual. What are some other things that women can do to reclaim the sacred in their lives? SS: The number one rule of women is that we need a women’s circle; we need to create trust between women. One of the most heartbreaking things for me is to realize, that in the West, we don’t have trust. In Africa, when I was growing up, it was a given that you were always honest and truthful with other women. you could only say things the way they were. The understanding is that women work with the web of life. and impacting all women around the world. Bettering our relationship with other women is very important. There is a lot of healing that is needed in the root, in the foundation of the feminine. and take it until they collapse. The backbone of society rides on women. In order to have a healthy community, you have to have healthy women. In the Dagara tradition, they say the best way to destroy a culture is to destroy the women first. My suggestion is that we work on ourselves and on each other in bettering our relationship with the feminine. and the kind of powers that enable us to carry out a healthy relationship with men. Remember that to be a woman is an honor. Learning to harness the power of the feminine will help us get to our purpose. and, Pray for Ancestors, Guardians or Guides ? and, do it, so you can cover all the bases ? where you will NOT be disturbed. that goes direct to your soul. to amend after incarnating into your current life cycle. will become part and parcel of your "Book of Lives" and, of this lifetime. ~and, then, they should burn it. that, i am without my dearly departed Father aka My Popa. if you wish to go further back, just simply multiply for another 7 times, to infinity. and/or spirit guide to other beings, or souls. to your own assortment of guardians, and, guides. which measures approx 56" x 56"
and, always utilize the colour of white, or off-white fabrics. To The Connections with Your Ancestors, Guardians and Guides. as, an "offering", or "the offering". solely on their own power, to do so. Also, it is OK, for you to dance, sit, or stand, while you choose to do your chosen work. We offer, refer to this work, as, your 'good work'. Also, do NOT set up any sacred space in your bathroom, basement or bedroom. to sit for seven (7) full days. just allow it, to be. and, that they are indeed taking to drinking your offering of the sacred water. NEVER, refill this glass, until after your ceremony is complete. and, NEVER rush out of any sacred ceremony, or sacred circle. that, the most profound things begin to occur. that you choose, to do. at exactly the same time of the day, or the night. that is used for other things. to eXchange with your ancestors, guardians and guides. to let it burn, or, to put it out. and, it is always there, ready for that purpose. and, my stating this intention, three (3) times. and, through offering Prayer, via your action of Praying. It is all about The eXchange, never forget that. which is used to define us, and, them. and, The Higher Central Vertical Channel. to begin a dialogue with your Ancestors, Guardians or Guides. in this particular eXchange, and, eXchanging process. before any of them, will come into action, and, enter the eXchange. should you choose to make this, a part of your ongoing requests. in any unnatural or man-made type of plastic or wrap. you want to bring forth in this particular eXchange. You can call in, as, many or as few as you choose, it is always your choice. and, only those that have a desire, to come to us, at this time. With the 'end result' being love. when you are finished working in the spiritual realms. and, the answer, could come to you, in unusual ways. dream_time, can be a very important time. Sometimes, it will be you, that dreams up a solution, to a problem, or the question. to the problem, or the question. Sometimes, the problem, will just absolutely disappear or completely vanish. and, if you can, keep a notebook & pencil on your bed-stand or night table. to The Sacred Hoop of Life & The Sacred Hoop of Lives. Children play behind a pumpkin carved and lit for Halloween, on October 30, 2013 in Monterey Park, California. It’s Halloween! Shop windows are full of decorations—Witches and ghosts and pumpkins galore. For those of us who are Witches — that is, who practice the ancient Goddess-centered traditions that hail from Europe and the Middle East — this time of year is both beloved and dreaded. Suddenly Witches are everywhere! But the Witches of the pointy hats and the spooks and cobwebs of your haunted house are themselves only faint ghosts of the real mystery of the season. For us, Halloween is the time of year when we come together to honor our ancestors, to mourn our beloved dead and celebrate their lives. In this autumn season, when the year itself appears to by dying. As the leaves fall, and the harvest is gathered in, we celebrate the ancient Celtic festival of Samhain or Summer’s End. The veil between the worlds is thin, we say, and those who have gone beyond can now return and visit us again, reminding us that death does not destroy our connection to those we love. Death and loss come to us all, in life, and to get through them, we need community. When we suffer a profound loss, the deepest comfort for our grief comes from the care and love we receive from friends and family and community. In our Reclaiming Pagan tradition, we proudly call ourselves Witches, in alignment with those who were burned and persecuted for holding to the old ways, those who guarded the ancient healing practices and mystical knowledge, those uppity women of wisdom and courage. We celebrate Halloween with intimate gatherings to honor our own beloved dead and with big, public ritual extravaganzas like the Spiral Dance we hold each year in the Bay Area, with elaborate altars, a full chorus, dancers, stiltwalkers, musicians, drummers, and a spiral danced by more than a thousand people. And we enjoy those common customs that still retain echoes of the old mysteries. For when the veil is thin, the Mysterious Ones come walking through. Once we expected spirits to come visiting and lit their way with candles and gave offerings of the harvest. Today they are likely to take the guise of children dressed as princesses and cowboys asking for a trick-or-treat. But children are, after all, the ancestors returning, and we still light their way with jack-o-lanterns and give them offerings. But this Halloween is different. As fires rage and radiation pours into the ocean, as climate change spins into an unstoppable cycle, the deep dread we carry is this: Will we leave a living world to those who come after us? Will we fail the ancestors, those who have gone before and those who return? In the old traditions of Witchcraft, the year is a cycle. Every ending, therefore, is a new beginning. The time of death is also the year’s rebirth. We can remember that lesson as we face the huge challenges and immense losses of these times. We need to make deep and profound changes in the way we live, if we want future generations to inherit from us a viable planet. Change can be frightening, but it can also be exhilarating. Halloween tells us to connect, to forge bonds of love that death cannot sever, to support one another as we face those things that are hard to face alone. Light a candle. Remember a friend. Cook a favorite dish of someone who has passed. Tell a story about their life. Pass the memories on. Trust that the ancestors want to help us, they want us to succeed. Accompany the little witches and cats and superheroes as they collect their candy offerings. Don’t eat it all at once, but savor the sweetness as the days grow darker. Know that you are an ancestor of the future, and your choices, your actions, your human hands can turn the wheel of fate. Starhawk is the author of twelve books, including The Spiral Dance, The Fifth Sacred Thing, and her latest, The Empowerment Manual: A Guide for Collaborative Groups. She is one of the founders of Reclaiming, an extended tradition of Pagan spirituality, and directs Earth Activist Training, which teaches permaculture, ecological design with a grounding in spirit. Her website is http://www.starhawk.org/. - everyone will wake up to their full 'raft of potentials' "
on my spiritual analysis photo, you can clearly see the healing spirits which she uses. and she has a true control of these healing spirits. Thank You Susan for allowing the pleasure to reveal what these spirits look like in there ethereal form.